There’s a school of thought, with which I broadly agree, that insists that a bike ride is not really a ‘proper’ bike ride unless at least one night has been spent in a ditch or somewhere else equally unsuitable, such as a bus shelter. Jack Thurston, the presenter, writer & producer of the excellent Bike Show podcast, is a man that thinks that any bike ride could be enhanced by a night in the right ditch, but not just any ditch. Jack, whilst being a hard and hardy rider, will not needlessly inflict discomfort upon himself or any companion. He views the riding of a bicycle as the literal pursuit of hedonism, albeit ameliorated by some passing and minor inconveniences. 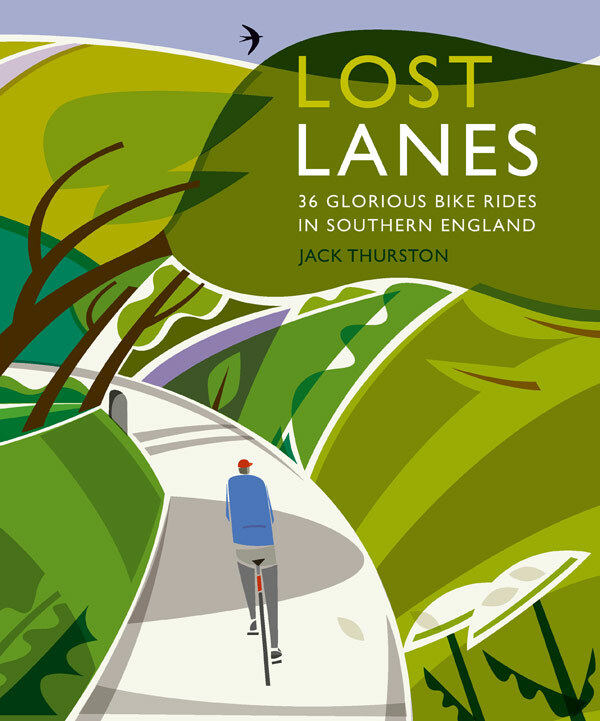 Jack’s approach is reflected in ‘Lost Lanes’, which is a collection of 36 rides in southern England. Most are day-rides, none require the intervention of a motor-vehicle to transport rider & bike to the start and, as the author says, all of ‘the rides can be ridden on any bike that’s in good mechanical order’, i.e. they are rides that anyone, not only ‘proper’ cyclists, could do, if they desired. All the rides pass by excellent pubs, cafes & restaurant, which are noted in the text. These are rides for the pleasure of being in the countryside (mostly – one ride is entirely within urban east London), because Jack believes, and I agree with him, ‘of all the modes of travel, only the bicycle combines freedom and speed with total immersion in the surroundings’. The format of the book is that the actual routes are downloaded (either as turn-by-turn route sheets or as GPX files suitable for use with GPS route-finders) from elsewhere, and the book is descriptions of the routes in lyrical prose, which includes topographical and historical details, and pencil-drawing outline of the route that could be transferred reasonably easily to a map and illustrating photographs. The photographs are superb. My girlfriend’s reaction to the book was that ‘it makes England look like France’. I think she meant beautiful and warm. She also said the book made her want to get on her bike and go do one of the rides. Jack has written a Tour de Horizon as part of the introduction, as well as a section on lanes and another on wild camping, which I rather like. It really is a literal panorama – Jack describes the country we will be riding in from ‘the shingle spit of Dungeness’ to ‘Suffolk’s cluster of stunning medieval towns and villages’ and on to ‘the gently rolling landscape of the upper Thames Valley’. He briefly covers the geology, topography and demography of the whole area, which I found admirable. At the back of the book, he has included some suggestions for organised rides, and includes the Dunwich Dynamo, which most London cyclists are probably familiar with, and one which I have never heard of ever, the Foulness Island Bike Ride, but which I very much want to attend, having read Jack’s description of it. I haven’t ridden outside of the M25 quite as much as Jack has, but I have ridden fairly extensively in the south east, but there was plenty in this book to inspire a jaded old hack such as myself. Like Anna, flicking through the book made me want to get on my bike and ride somewhere new. I am looking forward to an opportunity to ride ‘The Fifth Continent’, a loop in Kent from Ashford to Rye and along to Dungeness. Being an east Londoner, I have had to make do, for the moment, with Ride No. 28, the Eastern Excursion, which passes from Hackney to North Greenwich and south across to Charlton and back to Hackney. I can report that the route card and the GPX file work well, and the fact that I took 3 hours to do a 2 hour ride is entirely down to my own dawdling and inability to look at the route sheet at the correct points. If you listen to the Bike Show, and enjoy it (which I am sure all readers do), then you should buy this book. Not least because it would only be polite to show your appreciation of Jack’s efforts, which have hitherto cost you nothing, but also because this is an excellent book from which everyone can learn something. If you are planning to buy the book, please consider buying it directly from the Bike Show web-site, rather than somewhere else – Jack will get more money if you do.